This post was originally shared on Mari Venturino and Justin Birckbilcher's Teach20s blog. 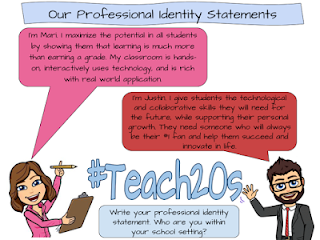 They are creating a community of young educators and mentors and share on their blog and on Twitter with the hashtag #teach20s. The post below is edited and partially excerpted from Creating Classroom Magic by the author. Justin and Mari used the process described below to discover their professional identities. Invest a few minutes in yourself and your future right now. Take time to reflect on and expand your dreams; define your life’s purpose as a professional identity statement; and share this statement with others. Consider what you want to do in this world and who you want to impact. Think about how you can have the impact you desire. Allow your imagination to run wild, come up with Blue Sky ideas (don’t put a limit on yourself, allow your thoughts to drift as high as a big blue sky). After you have imagined the possibilities, it’s time to make your dream clear so that you can communicate it to others. Many companies and corporations create a vision statement to provide a clear description of a dream. The professional identity statement you will create today states your purpose. It includes a set of ideas that describe the future state of your personal or professional life. Consider what the best case scenario is for five, ten, twenty or more years from now. Dream big. That is your professional identity statement, or your vision statement. For many years, the Walt Disney Company’s formal vision statement was: “We make people happy.” In recent years, it’s been changed to a much wordier statement that defines that purpose in an unnecessarily extended way. Ask almost any Disney employee and they’ll still tell you the vision of the company is those four simple word: “We make people happy.” I think that’s an extraordinary vision. Not only is it clear and concise, but it describes everything that Walt Disney aspired to do. I discovered my life’s purpose, my own personal vision statement, nine years into my formal teaching career. I watched the ambitiously named “How to Know Your Life’s Purpose in 5 Minutes” TED Talk by film producer, Adam Leipzig (who, incidentally was an executive at Disney at one point in his career). In his talk, Adam asks five deceptively simple, but remarkably poignant questions. They led me to define my professional identity statement as a vision. You can do this right now. It could even take you less than five minutes, especially if you’ve given yourself time to dream. Write something down as soon as you’re done reading these instructions. If you don’t love it, come back to it later. What is the one thing you feel supremely qualified to provide to other people? What do these people want or need from you? With those five questions, I defined my life’s purpose: I’m Shauna. I create safe, inspiring places for kids. They need someone who believes in them. I help them become the people they never knew they could be. Once you have a professional identity or vision statement, live it. Come back to it often. Share it. Post it - physically or online, or both. 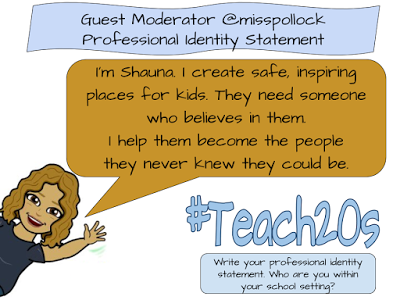 This week, share it on Twitter with the hashtag #teach20s. Consider doing what I did and using your vision statement as your profile description on your social media accounts. Your professional identity statement will help direct you when you’re feeling lost or don’t know what decision to make. You can refer back to it and modify it as your dreams change and grow. By defining your vision, you will find it easier to chart your path in life. Your vision is your definition of success. Reflect on your progress often and celebrate all the things you do to live your life’s purpose. Reflect on your life's purpose. Guide your students to do the same. Share your thoughts below, on Justin and Mari's blog, on your own blog and/or on Twitter, using the hashtag #teach20s!